OK. So I’m making the time. I’m also finding that’s only half the battle. Many practiced writers will probably be thinking that this is obvious, and, really, I knew it already. But this month, with more regular writing time, I’m realising that just because you’re sitting down, doesn’t mean your brain is willing to cooperate. I’ve already written about how distractible I am. And a quick google will tell you myriad ways to stay focused, but I thought I’d share mine. For starters, I turn the Wi-Fi and data off on my phone. It’s a simple thing, and I don’t feel that (admittedly ridiculous) panicky I’m-cut-off-from-the-world feeling that our dependence on technology has cultivated. It’s still on; I can still get calls and texts. Emergencies are covered. The cousin of that first step (and one I’ve missed accidentally in the past) is to close the web browser completely. If I need to look up the meaning of a name, or research fabric patterns of the 1970s, fair enough. But I can too easily get distracted by whatever I was last doing before I opened my work-in-progress. Music on or off is a day by day decision. It entirely depends how ready to flit away my mind is. Because, honestly, I prefer to write to music. It can’t have lyrics. Instrumental only, please. And not too intrusive. But some days my mind proves it can’t behave and I have to turn the music off completely. But, I hear you say, these are all pretty standard. 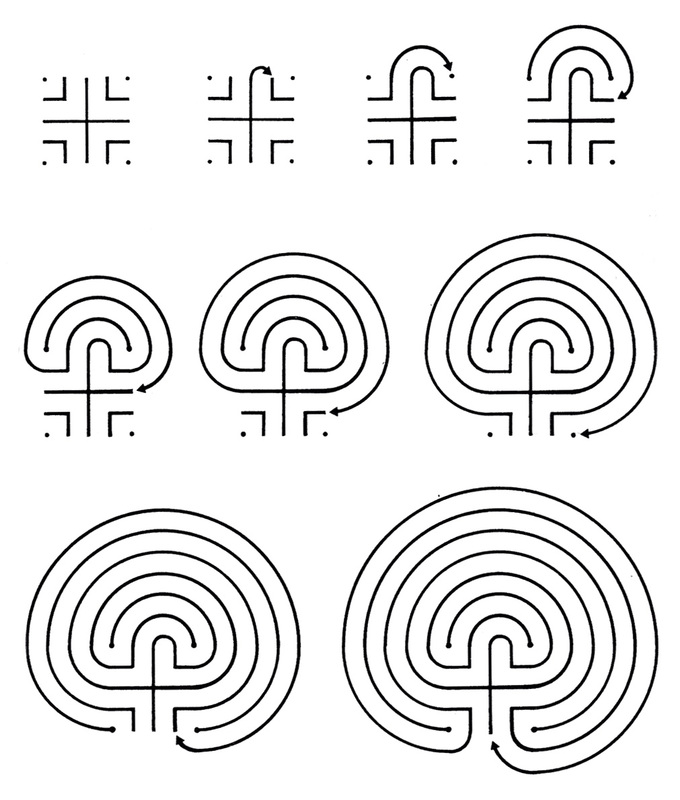 The one that might not be quite as common is my finger labyrinth. My mother discovered I have a fascination with labyrinths a while ago. And, like happens more regularly than is explainable, shortly thereafter someone at their church happened to be selling the very thing I’ve become interested in. 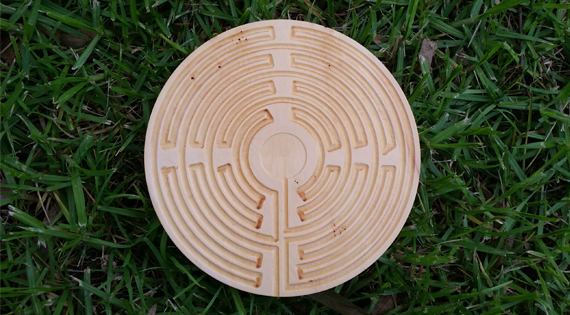 When their church was auctioning off various goods and crafts to raise money, enter stage left: a small wooden finger labyrinth. She knew her son would like it. She tried to buy it only to be outbid by someone who REALLY wanted it and the price got very high. The next week, however, the lovely and skilled man who had made it presented Mum with another one and said, “This is for Michael.” For payment, Mum made a donation to a school and orphanage in South Africa where members of their church are currently volunteering. Mum was only wrong in one thing: I don’t like it, I LOVE it! After all the noise is taken care of (see steps 1-3 above), I carefully trace the path with my left index finger. I focus on my breathing, and think about what I’m about to write. 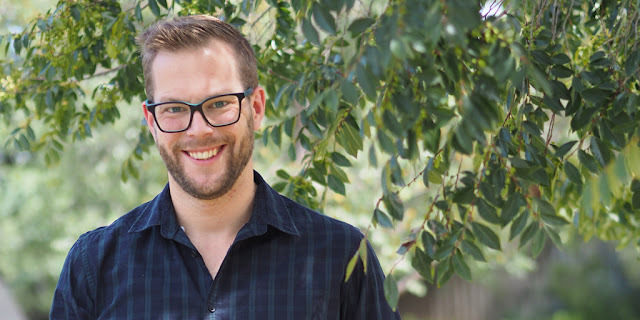 What question do I want to answer when I’m writing? Where do I envision this writing session finishing? The end of the chapter, or the end of the scene? I take my time. When I reach the middle there’s a sense of relief, of satisfaction and a sense of direction. I take a moment to enjoy it, then start my way back out. By the time I’m done, I’m feeling ready to get into writing. 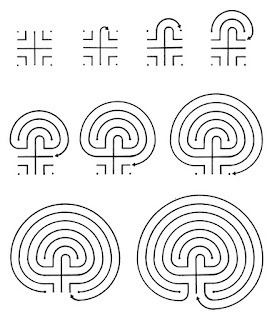 The beauty of the labyrinth is that there is only one path. 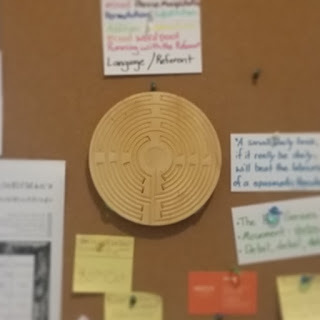 I read somewhere that “You enter a maze to lose yourself, and a labyrinth to find yourself.” I feel this; like the distractions have gone, and the path ahead is straightforward. It may twist and turn, I can’t see what’s coming, but I know I can charge right in. Fingers on keyboard typing my way through it. You can draw your own, if you’re so inclined, following the path with your finger or your eyes. On a brief side-note, you’ll have no idea how blown away I was when I discovered that there is a public walking labyrinth not 5kms from our house. When Bryan and I were on a walk along Merri Creek one day, lo and behold, one of the things I’d been pinning on Pinterest for years. The very first one I’ve come across in reality. 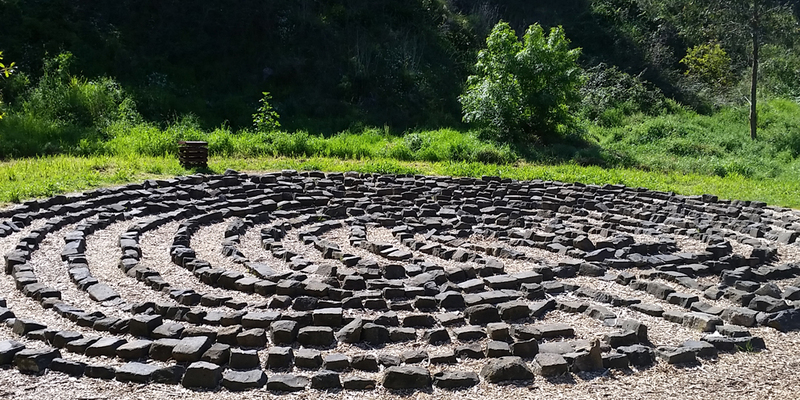 Unfortunately it’s hard to get there at a time when there aren’t other people, or children playing (which provides its own joy, just not the personal stillness I look for in a labyrinth), but I love that it’s there, and I promise myself to make more use of it. What do you do to clear the mental desk to get ready for working? I really enjoyed reading this Michael. You'll get there you know - determination that's the key.